“This is the most delicious book on my bookshelf. The poems will make you laugh, cry and wax nostalgic. (Be sure to savor Gail Peck’s elegant poem How Considerate of Pears.) And the recipes will make your mouth water. No wonder the little stone Buddha on the cover has such a satisfied smile on his face. Featuring work by five dozen poets, including NC Poet Laureates Fred Chappell and Kathryn Stripling Byer, and dozens of other nationally celebrated writers. 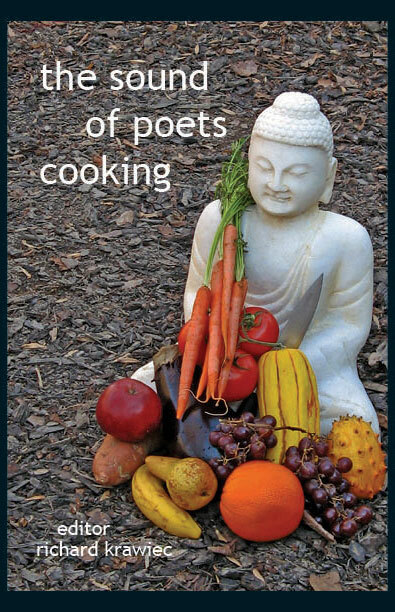 The poems alternate with recipes written by the poets, their family members, lovers and friends. The writing is at turns sensuous, hilarious, elegant, and playful. The recipes range from Asian, through European, to Middle Eastern dishes, as well as regional favorites from across the U.S.–tiramisu, homemade curry, vegetarian meals, exotic seafood, some simple, some complex. There is something here for every palate, literary and culinary. Proceeds from the sales of this book will be used to fund writing workshops in excluded communities. Contact us for print availability.